NEW YORK - Don’t worry, baseball fans. 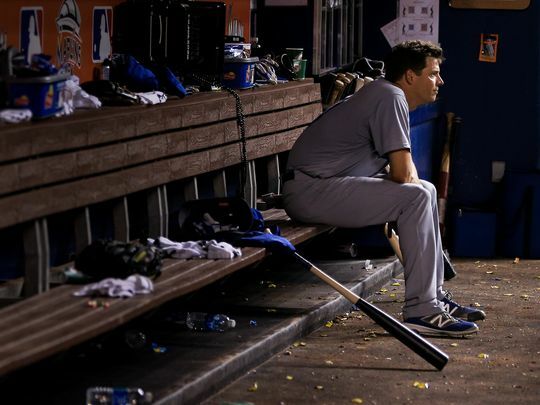 You’re not alone in marveling at the incredible success story of Los Angeles Dodgers starting pitcher Rich Hill. “Any time you see a guy dominating major-league hitters, knowing that he was in independent ball less than a year ago, it’s crazy to think about,” teammate and three-time Cy Young Award winner Clayton Kershaw told MyCentralJersey.com. Just last season, the 36-year-old left-hander was in the Atlantic League, beginning his quest to show major-league teams he could be a starter after having primarily been used as a reliever since midway through the 2010 season. But none of them were willing to give him that chance. He began 2015 with the Washington Nationals, but Hill opted out of his contract on June 24 after posting a 2-2 record and 2.91 ERA in 25 appearances for the Triple-A Syracuse Chiefs without receiving a big-league promotion. After nearly a month went by without any offers, the then-10-year MLB veteran signed with the Long Island Ducks. Although the Somerset Patriots were in town when Hill first set foot in Bethpage Ballpark at the end of July, he never faced them, instead debuting on Aug. 2 against the Bridgeport Bluefish, which was followed by one last start seven days later against the Camden Riversharks. In the second outing, he tied a franchise record with 14 strikeouts over six shutout innings, and it was clear he wouldn’t need to make a third. Hill signed a contract with the Boston Red Sox several days later without having ever allowed a run with the Ducks. Standing in the visiting dugout at Yankee Stadium this week, he finally had time to reflect on his brief stint in independent baseball. “I understand why I was there, I don’t think there would be an opportunity with an affiliated club if you haven’t started in six years or so,” Hill said. He made five starts for Triple-A Pawtucket and subsequently was promoted to the big leagues. Since then, he’s posted a combined 1.74 ERA in 124 innings of work for the Red Sox, Athletics and Dodgers, who landed the starter in a blockbuster trade with Oakland, who had signed him to a one-year, $6 million deal in the offseason. “He’s been the best pitcher in baseball since we got him,” said Kershaw of Hill, who has gone 3-0 in 19 scoreless innings since the trade. But how, exactly, does someone go from pitching in the Atlantic League to earning that distinction in less than a year? “You work, you continuously keep putting in the effort,” said Hill, who was removed from his start on Saturday after seven perfect innings. “This is something that I’ve always wanted to do, get back into starting. And since 2005, in some capacity, I’ve been at the major-league level. You’re looking at eight big league years since 2005. Last year, I think it was just the opportunity I had to go to Long Island and reestablish myself as a starter. Having that opportunity was great, because I was able to showcase my ability to start. Hill, one of 11 former Atlantic League players playing in the majors, has now become a poster child for the success of the top independent circuit in the country. “It was great; great environment, very upbeat, very positive,” Hill said of his time with the Ducks. Now, Hill finds himself on a major-league team that many think have a chance to advance to the World Series, thanks in large part to a starting rotation that currently features him, Kershaw, and rookies Kenta Maeda, Julio Urias and Jose De Leon. “To have the opportunity in LA and to go down there and do something special down the stretch, it’s going to be fun,” Hill said.